When police turn to technology to catch a criminal, innocent bystanders -- and their personal information -- get caught in the fray. At least 55 local and state police departments in 22 states and the District Of Columbia own stingrays, surveillance devices that can dupe your phone into offering up its location and other information, according to the American Civil Liberties Union. At least nine agencies in California own the gadgets. Six local police departments in Maryland and five in North Carolina are also known to have them. Still, it wouldn't be accurate to say you're most likely to have your cell phone tricked in the 22 identified states. Authorities in other parts of the U.S. may secretly be using stingrays, so actual usage overall is probably a lot higher than what's been calculated. Stingrays, also known as cell site simulators or IMSI catchers, mimic cell phone towers and send out signals that fool phones into transmitting info. When used to track a suspect's phone, they also gather details about the phones of countless bystanders, says the American Civil Liberties Union. A dozen federal agencies, including the FBI, Secret Service, Drug Enforcement Administration and Immigrations and Customs Enforcement are also known to use the devices. 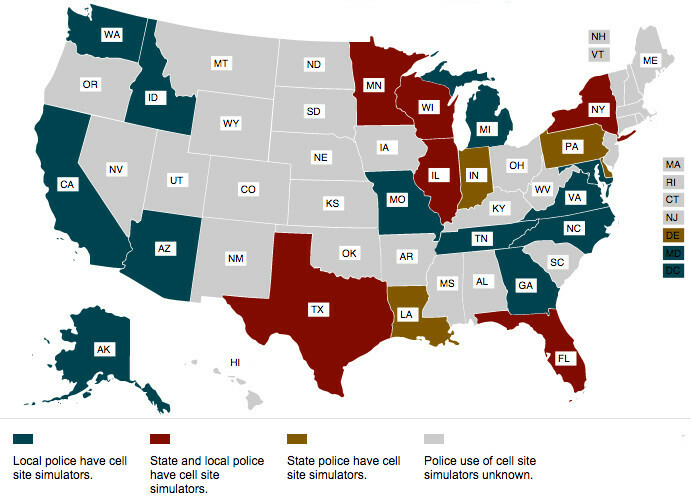 The post Police In These 22 States Can Trick Your Cell Phone appeared first on Vocativ.